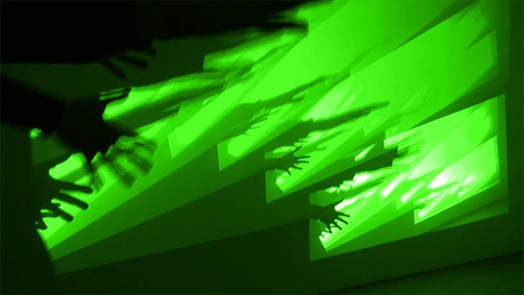 Emergent Void, from null to ∞ from Daniel Siqueira on Vimeo. 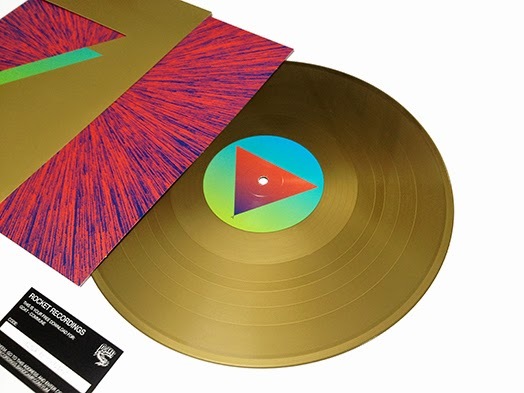 Hot off the press, here is a first look at the Gold vinyl version of Goat's new album Commune that is being released on September 22nd. Here is a constantly updated post of reviews of Goat's new album Commune that is out on September 22nd. Teeth of the Sea are joining an incredible line up of bands at Baba Yaga Hut's RAW POWER Festival at the Dome / Boston Arms on the weekend. 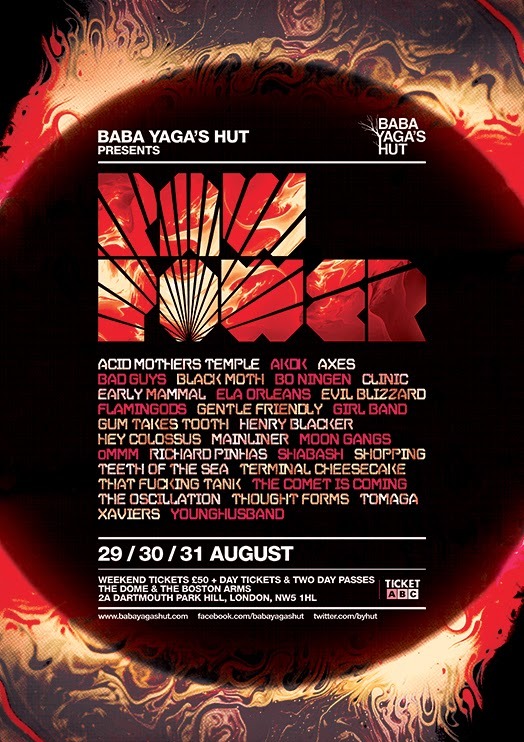 Joining Teeth of the Sea will be Heldon legend Richard Pinhas, Thought Forms, Hey Colossus, Evil Blizzard, Gum Takes Tooth and MANY MORE..
On the 29 / 30 / 31 of August Baba Yaga's Hut is taking over The Dome & The Boston Arms in Tufnell Park for the second outing of RAW POWER. Two stages, 3 days featuring some of the best psych heaviness, space rock, synth crazyness, left field electronica and much more. 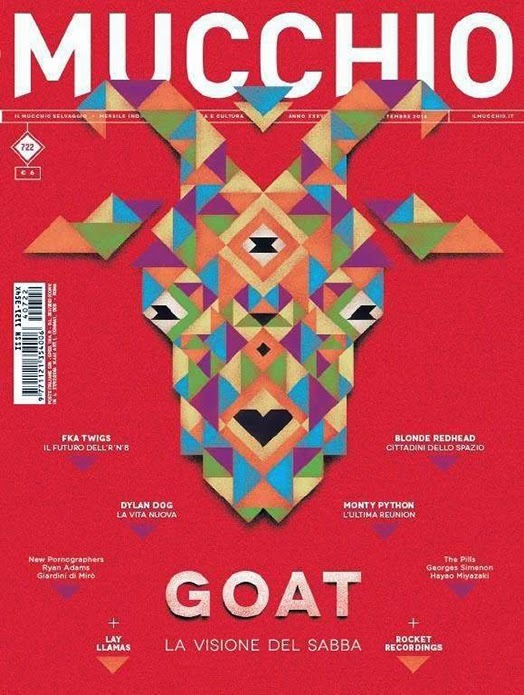 The italian magazine Mucchio has a massive article on Rocket, Goat and Lay Llamas in their latest issue of their magazine. It is probably our most in-depth interview. So if you can read Italian it will be well worth the read!! 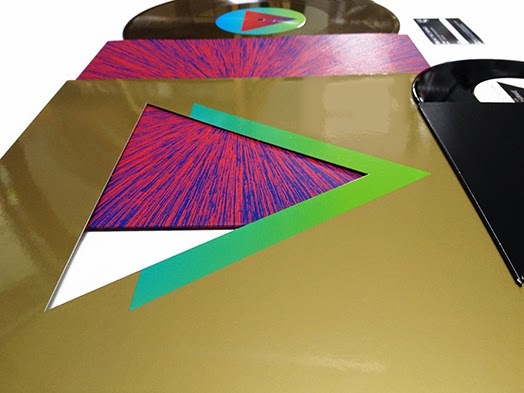 Here is a great review of Goat's new album Commune by Danny Riley for The Quietus. Album is released on 22 September. "When approaching the follow-up to a record as unilaterally praised and, on a personal level, so intoxicatingly enjoyable as Goat's 2012 debut World Music, all kinds of anxieties are inevitably thrown up regarding the new work's comparative merit. Which is why for this writer, on hearing how the psych journeymen chose to open their latest record Commune – with the ominous clang of a temple bell (like a theological inversion of the opener on Black Sabbath's debut) – it felt oddly apt, fateful almost. It was as if they knew I was scared to listen to the record; they responded by scaring me further with ecclesiastical percussion instruments. Goat should be given full credit for inspiring this sense of meaning and excitement; the album that follows is no stylistic leap forward for the band, yet it still exercises a deeply persuasive power over your head and hips. 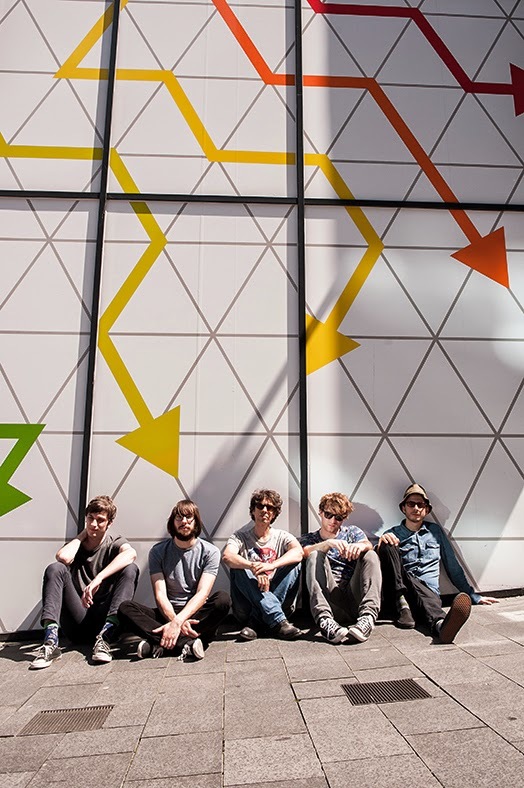 They largely stick to the heavy, kinetic, afro-influenced rock that proved such a winning formula, the only obvious developments being that the guitarists seem to be taking more cues from desert-rockers like Tamikrest and Tinariwen, and the songs show an increasing preference for subtlety over immediacy in the hooks department. 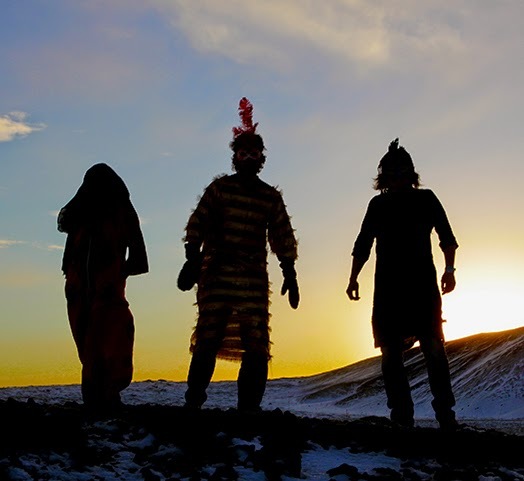 Yet despite the apparent lack of new ideas here, the undeniable success of this work lies in Goat's deepening and development of the musical and spiritual themes presented on in World Music..."
Like many bands in the burgeoning neo-psychedelic scene, Italy’s Lay Llamas trade on repetition and comparatively few notes. However while many of their contemporaries take the Loop/Spacemen 3 route of two chord drone as their template, Lay Llamas draw on more myriad influences as befits a band who can boast stable mates of the quality and inventiveness of Goat, Gnod and Teeth and the Sea. These include obvious nods to World music in the shape of Goat-style Afro-beat as well as embracing a more math-rock dance vibe of the Suuns variety. A constant factor from the opening tribal stomp of Ancient People of the Stars” is a thoroughly simple yet stunningly effective series of bass lines which underpin most of what is to follow. “We Are You” develops the shamanic ghost-dance-by-campfire aatmosphere as the rhythm section and techno-synthesis coalesce to offer up spaced out loops and grooves aplenty. Nowhere is the bass better executed than on “Desert of Lost Souls”, the rest of the instrumentation floating around it as if in a cavernous void while the vocals insinuate themselves from a box room in next door’s attic (assuming that the attic is in another dimension). “Archaic Revival”, wherein a creaky intro bubbles into a hypnotic and quite compelling beat is quite simply one of the best things here, while “Something Wrong” in which ambient drone gives way to lysergic Afro-funk and the delicious Afro-Asian cosmic dub of “In Search of Plants” also hit the spot. Footage of Teeth of the Sea at Milhoes De Festa recently. They also shared the bill with Lay Llamas!! Gnod have been added to the bill of Supermassive festival in Helsinki on 24 October. They join a really stellar line-up that includes The Fall, Fabio Frizzi, Circle, Bong, Tim Hecker, KXP, Umberto and many other great names! Welcome to Volume 7 of our ongoing 'Multiple Exposure' series where we ask musicians to tell us about their favourite pieces of repetitive music. 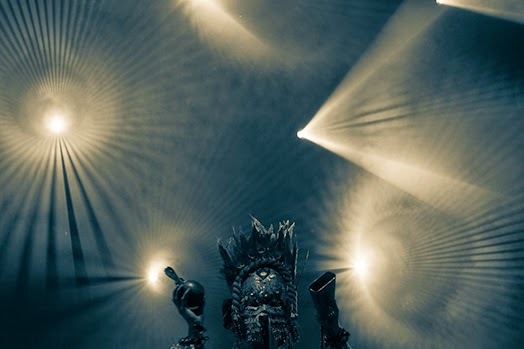 Among the ancient roots of repetitive music, somewhere you will find mantra. According to the sleeve notes of this collection it explains that, “the monks have mastered the ancient art of multiphonic chanting...each vocalist produces a chord encompassing two or three tones through the manipulation of overtones”. The low-pitched singing is known as “Gyu Me”. Back before Adam Ant and assorted stompers, the Burundi Drummers knew how to rip up a trancing beat. The sound is made of many rhythms, each representing an important concept. Some rhythms relate specifically to the life of the drums and the drummers. The percussion and the dance are inseparable. The Frippertronics album 1984 has been a bit ignored compared to the starlight twinkling of Evening Star and No Pussyfooting. This is where Robert really got into the repetition, and apparently it “starts where God Save The Queen ended”, God Save the Queen being the album featuring Under Heavy Manners with David Byrne. The sleeve notes of Let The Power Fall make fascinating reading, detailing the steps and strategies in Fripp’s infamous plan for the Drive to 1981. It took me some time to chose just one track from either of La Düsseldorf’s two albums, but I kept coming back to this rather than the cool morning sunshine of Cha Cha 2000 or the punkier throb of the (almost identically named) La Düsseldorf, the second track on the same album. This one really is a classic. Julian at the peak of his powers, directed by Thighpaulsandra. 73 minutes and 45 seconds of “a simultaneously-synthesized parallel-harmonic Breathing Meditation”. If I remember rightly he is quoted as saying something like “it really kicks in after about 40 minutes”...class. I would have gone for the Velvets, but that would have been too obvious. Besides, this is great. Decades back I played a half hour version of Sister Ray in a pub in Islington with a Scottish band I used to play in called Brouhaha. It was one of the most ecstatic live experiences I’ve had - proper mad trance thing, so this track has fond and very out-there associations. Miles Davis - TatuI couldn’t find a full version of this online. Miles gets the funk and gets it good. This is a track from the fabulous Dark Magus album. There is stacks of superb stuff from around this period - check out the Fillmore albums, and both Agharta and Pangea. From the seminal Biokinetics album. Dub techno at its finest. 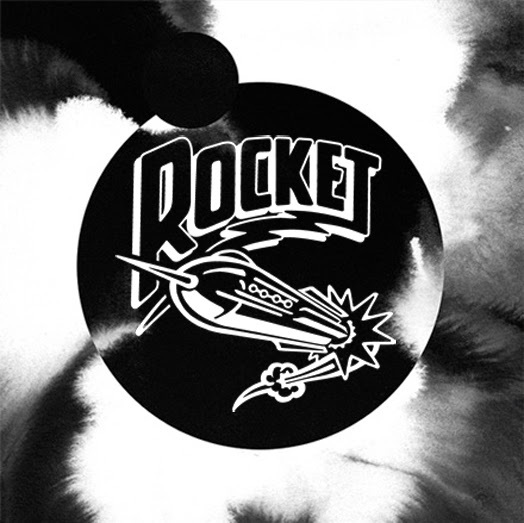 Minimal and submerged in waves of delay, this one worms its way into your sub(dub)conscious. I also recommend Thomas Koner’s Nunatak-Teimo-Permafrost trilogy - marvellous icy sounds of underwater gongs and frozen soundscapes. High Wolf - Shangri L.A. Fantastic hypnotic album from the master of loopinesses. Like being submerged in a psychedelic tropical jungle. From their classic self-titled debut album. As Archdrude Cope says in Krautrocksampler, “ a percussionless dreamscape of sounds cascades around the room...Ash Ra Tempel is at its greatest when it’s impossible to work out what instrument makes which sound”. 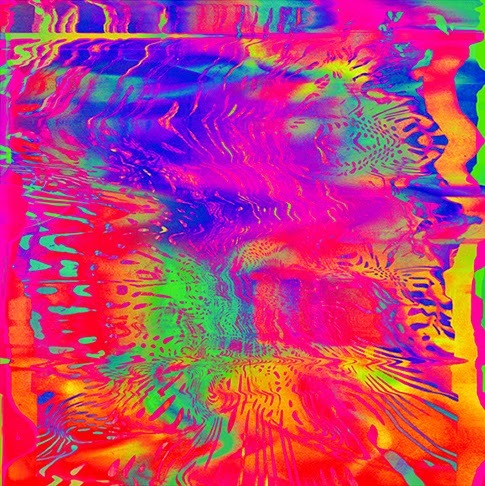 First generation psychedelic freakout. Listened to at suitable volume, this has a proper acid intensity and chaotic frenzy to it. This could well be seen as influential on the early Amon Düül, and krautrock as a whole. Taking Gong’s Master Builder to its illogical conclusion - one hour of intense riffage. Out there all the way. One of the great synth masters at his finest. Fifty minutes of glorious textures and timbres. This is from the Cyborg album, named after the Frank Herbert book according to the sleeve notes of the 2006 re-issue on CD, although I can’t find a book by that name. Perhaps it refers to the Cyborgs in the book The Eyes of Heisenberg - “mechanically enhanced humans long opposed to the immortals” according to Wikipedia. But Beautiful is the bonus track on the CD, recorded during a concert in Brussels in 1977. This was tough to do - I keep thinking of things I’d love to include. No Parson Sound, Boredoms, Jon Porras, Hawkwind? No Tangerine Dream - how could I leave out Tangerine Dream? And of course Gnod... Maybe I’ll have to do a second batch sometime. With just under a month to go Anthroprophh's - Outside the Circle album is available for pre-order. 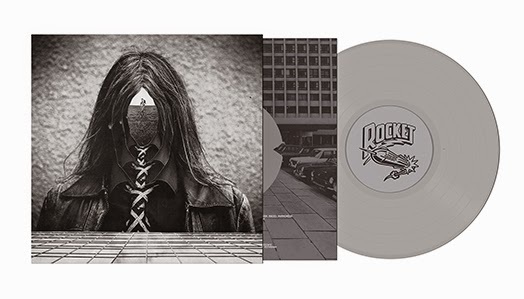 The album will be released on the 15th September in all good record shops and the vinyl version comes in as a limited grey vinyl gatefold with insert. Here's some footage of Goat playing Hide from the Sun in Detroit in June. Hide from the Sun is taken from Commune, the new Goat album released on 22 September. 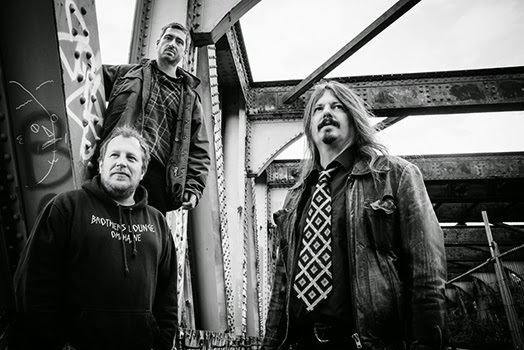 We thought we had to share the news that Geoff Barrow, the head honcho of Invada Records and Portishead/Beak member has been invited by Stuart Maconie to sit in for him on his next Freak Zone on Sunday 24 August at 8pm. Geoff has invited longtime friend of Rocket, the legend that is Fat Paul to join him on the show and talk about some Bristol Freaks. So knowing Paul some interesting stories (as well as great music) will be aired. So well worth a listen we think! Autumn is shaping up to be a brilliant time for heavy Psych fans with any number of new albums coming out from some amazing bands. One of those that I was particularly looking forward to is the new Anthroprophh album. The first album, mainly a solo project by Paul Allen, of cult band The Heads was great; and there was a sign of things to come in the 12” of Precession from that album, remixed with Bristol duo The Big Naturals, who are collaborating with Allen on the new album, a new track from which has just been released (see a review of both here). All I can say is that if this is anyway representative of the album as a whole then it is going to be immense. My first impression is that, man, is it heavy! Some great guitar work all the way through and some really heavy electronica, also picking up on the Eastern rhythms of the previous album. 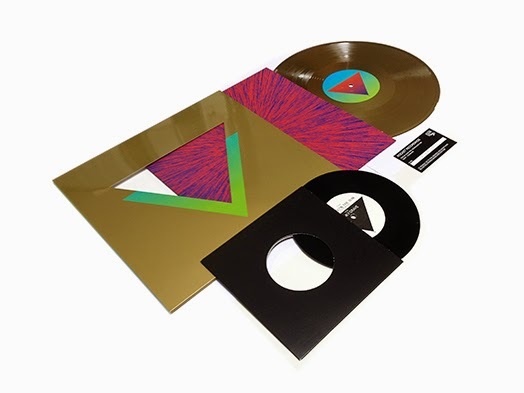 This has all the hallmarks of being one of the top releases of the year and, coming out in mid-September, just in time for the band’s appearance at the Liverpool Psych Fest: they’d better reinforce those old buildings as this could bring the roof in. Liverpool Psych Fest have announced the schedule for this years Festival. Other worthy mentions of the Saturday performers are Theo Verney, Satelleti, Lucid Dream, Alex Tuckers Grumbling Fur and ex Rocket band White Hills. 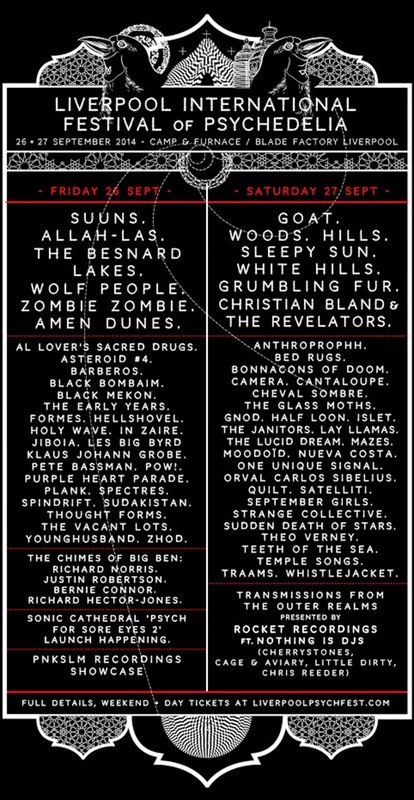 And Friday highlights for us are Though Forms, In Zaire, Spectres, Holy Wave, Al Lover, Black Bombain and Zombie Zombie. 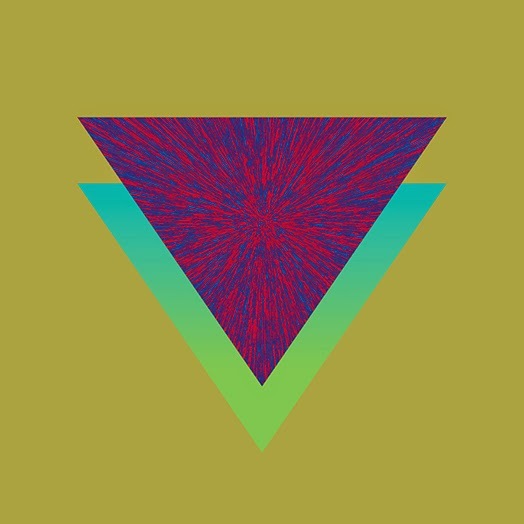 Here is the track Words – another amazing track from the new Goat album Commune that is released on 22 September. APPROACH & ATTACK - TEASER 2014 from Anttisworld on Vimeo. With help from local riders, Antti Autti and friends go deep in the backcountry in Approach & Attack, a snowboarding movie two years in the making presented by Anttisworld and Northlight Pictures. From pipejock to backcountry destroyer turned out Antti Autti is releasing his third movie. Few years ago, Antti made a total change in his game. After several years of riding contest after contest, altough with a great success, Antti decided he had to do something else. What he did was he followed a totally new path: he quit competing and began to shred powder, full-time. Approach & Attack has been filmed for two seasons all around the world. With locations as New Zealand, Japan, Norway and British Columbia it has arguably the best spots and deepest powder Antti and his crew has ever ridden. 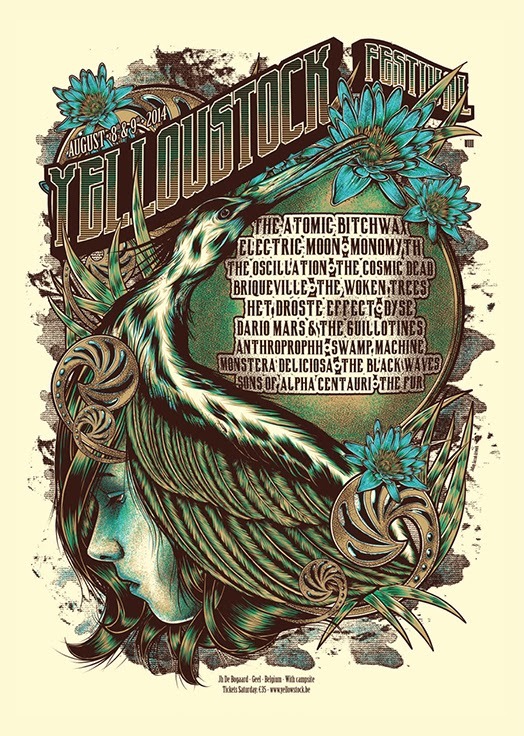 Anthroprophh play Yellowstock Festival this weekend. Dario Mars & The Guillotines, Swamp Machine, Monstera Deliciosa, The Black Waves, Sons Of Alpha Centauri + The Fur for 2 day festival 8th & 9th of August in Beligum's Geel. The band have a new album 'Outside the Circle' (Launch071) released 15th September 2014 & will be available on limited gatefold vinyl & download. Ahead of Liverpool Psych Fest, Getintothis‘ Patrick Clarke takes an in-depth look at Rocket Recordings, the independent label behind so many of this year’s headline acts. When it comes to modern psychedelia most have a tendency to look backwards, to saturate their tones in reverb straight from Revolver and to claim retrospective legitimacy. However though such groups (Temples, Tame Impala et al.) are by no means bad, there’s a sense something was lost in the process. When one looks back on an era before their time, what really thrills is the notion that Hendrix and co. were truly blowing people’s minds, pushing boundaries in a way that a revivalist just can’t. 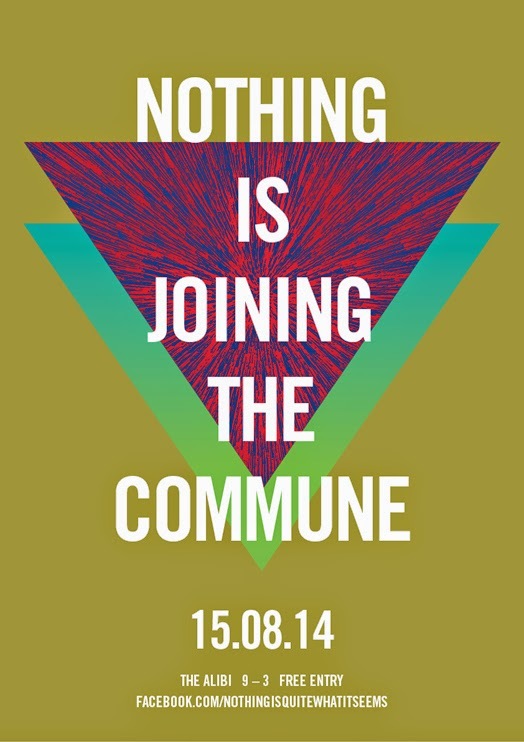 The first public airing of Goat's new album Commune will happen on Friday 15 August at our regular 'Nothing is…' night at The Alibi in Dalston, London. We will be starting the evening at 9pm with this first ever playing of their eagerly anticipated follow-up to their stunning debut album World Music, over one month before it's release on 22 September. Following that the Nothing is… regulars will be bringing their eclectic mix kraut, psych, cosmic disco, biker funk, psych jazz, spacey techno, afro rock, and all other strange sounds in-between. The original version of Hide from the Sun can be found on Goat's next album Commune which is out on 22 September. Goat are taking to the stage again this Sunday. This time for a rare show in their home country at the Stockholm Music and Arts Festival playing alongside Neil Young, Television, Seun Kuti and many others.